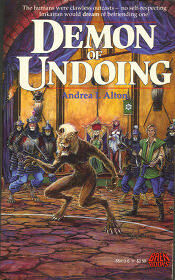 Fenobar is desperate to win respect; so desperate that he pins his hopes on the legendary Demons of Undoing. Reading between the lines, humans came to Imkaira hundreds of years ago, but their strange customs and innovations spread confusion, disquiet, and chaos. Dishonored by their accidental troublemaking, they “retreated from the world and were seldom seen again.” The Imkairans returned to their traditional customs. Ever since then, any hint of social change was blamed on the supernatural influence of a Demon. High-ranking Imkairans, the whitecrests (the commoners have dark crests), take a sholstan, a respected role-model, to follow and to live up to. Fenobar, ignored by the Fen establishment, secretly takes the legendary Demons as his sholstan. He has won what small honor he has by looking for the reason behind a tradition and using it in his favor. This works until the day Black Fentaru, his royal father, is defeated in personal battle by Thenorig the Mad, high king of the Chaligs. By tradition, all Fen goes to Chalig as trophies of war with Fentaru as his subordinate, but Fentaru orders Stells, his veteran sholstan, to take Fen’s ancient sacred Black Axe of Monghan into hiding at the distant mountain temple at Mone. Fenobar, as Commander of the Temple Guard, is the titular leader of the small troop of Fenirri. Everyone expects him to defer to Stells for real orders, but Fenobar recognizes this as an opportunity to stand out for the first time. Matters appear to go from bad to worse when Fenobar is separated from the other Fenirri by a landslide, and the rest of the Fenirri are captured by the Kaymath tribe as enemies in their war with the Monghanirri. Fenobar, alone, survives only by disguising himself as a Kaymath commoner. Without giving the whole story away, Fenobar suddenly meets a genuine Demon! He is conflicted between deferring to the Demon as his unexpectedly real sholstan, and ordering the Demon to help him rise to the prominence that he has only dreamed of. The Demon helps Fenobar and the surviving Temple Guard fight their way out of Kaymath. 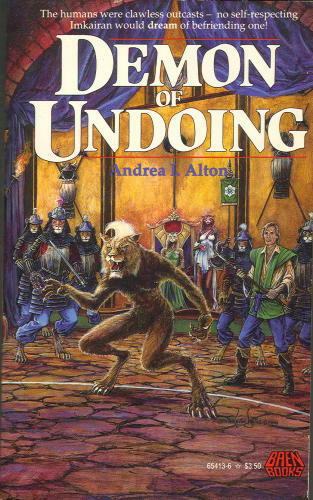 As they escape, the other Fenirri continue to regard him superstitiously, but to Fenobar he becomes a comrade-in-arms. The Demon cleared his throat. Not looking at Fenobar, he mumbled something at the mail in his lap. ‘I call myself Sig,’ the Demon said, a little desperately. ‘Human Being Sig?’ Fenobar asked sweetly. ‘Won’t,’ the Demon admitted miserably. Fenobar and Sig come to a working agreement: Sig will help Fenobar to rise in prestige with his fellow felinoids, and Fenobar will protect Sig until he can get back to the hidden castaway human colony on Imkaira. Fenobar is astounded when Sig teaches him a whole new way of fighting; karate trickiness instead of straight-on claws and fangs brawling. The two sapients’ different instincts make them truly Odd Couple friends, who cannot really understand each other but who respect each other’s differences. Through their partnership, the reader is plunged into the intriguingly complex Imkairan society, as they slowly gain status while making their way back to Fen and the challenge that defeated Fenobar’s father.